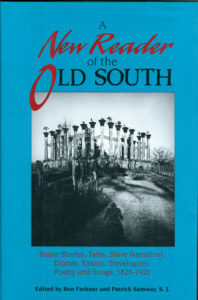 A New Reader of the Old South – Peachtree Publishing Company Inc. The literary Canon of the old South is redefined in this remarkable companion to the highly acclaimed A Modern Southern Reader. The literary canon of the old South is redefined in this remarkable companion to the highly acclaimed A Modern Southern Reader. Editors Ben Forkner and Patrick Samway, S. J. have selected from the most original and lasting works of nineteenth-century Southern writing (1820-1920) to reflect the full range of the Southern experience. The thorough introduction illuminates the individual pieces, providing insight into the culture of the Old South, from which rose a new generation of prominent, American writers. Features the work of Kate Chopin, Frederick Douglass, Paul Laurence Dunbar, Ellen Glasgow, Henry Grady, Joel Chandler Harris, Thomas Jefferson, James Weldon Johnson, Sidney Lanier, Augustus Baldwin Longstreet, Edgar Allen Poe, Mark Twain, and many others.